While the musical culture of the British Isles in the 'long nineteenth century' has been reclaimed from obscurity by musicologists in the last thirty years, appraisal of operatic culture in the latter part of this period has remained largely elusive. Paul Rodmell argues that there were far more opportunities for composers, performers and audiences than one might expect, an assertion demonstrated by the fact that over one hundred serious operas by British composers were premiered between 1875 and 1918. 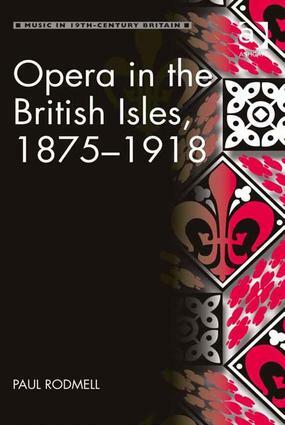 Rodmell examines the nature of operatic culture in the British Isles during this period, looking at the way in which opera was produced and 'consumed' by companies and audiences, the repertory performed, social attitudes to opera, the dominance of London's West End and the activities of touring companies in the provinces, and the position of British composers within this realm of activity. In doing so, he uncovers the undoubted challenges faced by opera in Britain in this period, and delves further into why it was especially difficult to make a breakthrough in this particular genre when other fields of compositional endeavour were enjoying a period of sustained growth. Whilst contemporaneous composers and commentators and later advocates of British music may have felt that the country's operatic life did not measure up to their aspirations or ambitions, there was still a great deal of activity and, even if this was not necessarily that which was always desired, it had a significant and lasting impact on musical culture in Britain. Contents: Introduction; Prologue: opera in the British Isles in 1875; Opera in London 1876-96; Opera in London 1897-1918; Opera in the provinces; ’The operatic problem’; Operas by British and Irish composers premiered 1875-1918; Epilogue: opera in the British Isles in 1918; Bibliography; Index. Paul Rodmell is Senior Lecturer in Music at the University of Birmingham, UK. He has previously published Charles Villiers Stanford and Music and Institutions in Nineteenth-Century Britain (both Ashgate). Paul has also contributed to other volumes, writing on concert and operatic culture in the British Isles in the nineteenth century. So much of our ‘common’ knowledge of music in nineteenth-century Britain is bound up with received ideas. This series disputes their validity through research critically reassessing our perceptions of the period. Volumes in the series cover wide-ranging areas such as composers and composition; conductors, management and entrepreneurship; performers and performing; music criticism and the press; concert venues and promoters; church music and music theology; repertoire, genre, analysis and theory; instruments and technology; music education and pedagogy; publishing, printing and book selling; reception, historiography and biography; women and music; masculinity and music; gender and sexuality; domestic music-making; empire, orientalism and exoticism; and music in literature, poetry, theatre and dance.